When faced with angry customers, rocketing fuel prices and IT meltdowns, utility executives don’t often think of the guys in hard hats as their top priority. It’s easy to say that field service operations could run more smoothly, but it’s harder to say how—and even harder to make it happen. 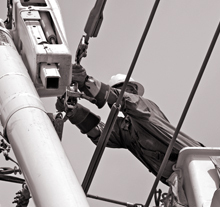 But achieving full potential in field service can save utilities a lot of time and money. Productivity and efficiency reviews targeted at field service operations, done correctly, can reinforce other areas of the business by increasing customer satisfaction and improving safety and quality. For many utilities, it’s worth another look. Historically, field service units—the crews that install, maintain, repair and replace various components of the core utility infrastructure—have been highly decentralized. Often run as mini and distinct geographic businesses with little oversight from the corporate headquarters, many field service units haven’t kept up with industry best practices. Additionally, it has also often been difficult to fully assess the field service opportunity due to inconsistent, and often poor, data quality. But with an increase in big IT automation projects and the accompanying emphasis on functional expertise, companies can ill afford to let their field service units flounder in isolation. Why is field service so often a company’s weakest link? First, in major markets around the world we have seen a rapid increase in both the workload and the costs associated with field service activities due to increasing capacity utilization and aging networks, the introduction of complex new technologies, and growing demand from customers (and regulators) for a wider range and greater reliability of services. Second, many field service units operate with low expectations for employee efficiency or engagement. The legacy of public-sector ownership includes corps of unionized field service workers who are sometimes inflexible and resistant to change. They are often skeptical of process simplification and look warily (if at all) at recommendations from corporate headquarters. And yet the increasing complexity of new technology has created real skill gaps for many field service workforces. Finally, with the difficulty in accurately measuring productivity, it’s hard to know when things are working well and when they aren’t. Getting to “full potential” first requires a definition of the opportunity for improvement, but even this can be difficult. Benchmarking usually falls short, in part because most companies lack reliable, comparable productivity metrics. The variation in work types (e.g., new business vs. maintenance vs. breakdown), a mix of different resource levels and types across units, and geographic differences further complicate the process. Instead, a more effective approach is a holistic diagnostic, which breaks down the various components of field service operations to see how efficient they really are. • “Overhead and other,” which addresses the costs of supporting nonfield activities (e.g., resource planning, dispatch) and nonlabor costs (e.g., fleet). Recognizing that unique units and divisions do—and often should—operate differently, an effective diagnostic looks closely at day-to-day operations in multiple areas. Once completed, the diagnostic quickly brings inefficient processes to light. It also provides a robust data baseline from which to measure and prioritize opportunities for improvement. In a diagnostic conducted by one US utility, for example, an analysis of how crews spent their time revealed that less than 50 percent was spent on actual maintenance or construction work. The upshot: in order to make crews more effective, executives would have to address key challenges in the areas of work order quality, scheduling, work support and performance management. The only other time Article 5 has been invoked is after 9/11 when all 28 countries volunteered to come to the assistance of the US.